The founder of Cornwall's national seal sanctuary will open new facilities at the centre on Tuesday. Ken Jones, who launched the sanctuary more than 40 years ago, will be at the site at Gweek, near Helston, to open a new pool. 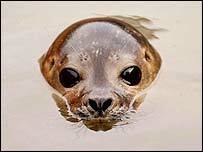 Its first residents will be two seals - called Flotsam and Jetsam - from Denmark who survived a killer virus. Mr Jones opened the original seal sanctuary at St Agnes on Cornwall's north coast. It moved to Gweek nearly 30 years ago. The refurbishedn pool is dedicated to the memory of his wife, Mary, who died in July.